Variety Insight Data Licensing features metadata for more than 6 million TV programs and movies, TV and celebrity images, and direct links to millions of social media pages. This data is carefully organized and delivered via our state of the art API to power next generation guides, second screen apps, and discovery platforms. 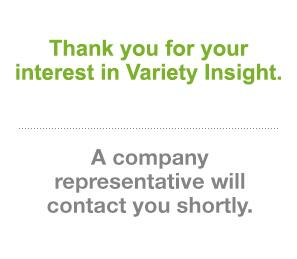 Variety Insight data licensing is the most trusted source for validated entertainment metadata. Variety Insight Data Licensing is the only data company to provide metadata around television, film, and digital content. In addition to comprehensive data for produced films, television programming and digital content, Variety Insight Data Licensing also offers comprehensive forward-looking information in regards to what film and television companies are developing in the next 12, 24 to 36 months. Click here to download a complete list of available data fields. Variety Insight's data is the best in the business, but we also have partnered with numerous work flow solutions that allows our users to import Variety Insight data into other applications. Salesforce is the world's number one CRM solution. Available for integration via API. Variety Insight is the only data platform that is an official partner of The Black List ensuring its projects and writers are accurately represented in our system and easily searchable. The Black List, an annual survey of Hollywood executives' favorite unproduced screenplays, was founded in 2005. Since then, more than 400 Black List scripts have been produced, grossing over $26 billion in box office worldwide. Black List movies have won 53 Academy Awards from 262 nominations, including 4 of the last 10 Best Picture Oscars and 10 of the last 22 Best Screenplay Oscars. Select product(s) below and fill out the form and one of our representatives will be in touch with a personalized quote. X Email id already registered.